We’d love your help. Let us know what’s wrong with this preview of Stand Up And Shout by Maria Bernard. Jay Sharp would rock the mic with the best of them, if not for his crippling stage fright. Alice Electra, a gifted guitarist, is living on the street, busking for money. A chance discovery leads her to Jay's struggling band. Romance blooms between Jay and Alice, but not all the band members are impressed with the young runaway. Now, Alice and Jay must face their greatest challenge: a massive Vegas festival. Will they turn their lives around, or will they crash and burn? 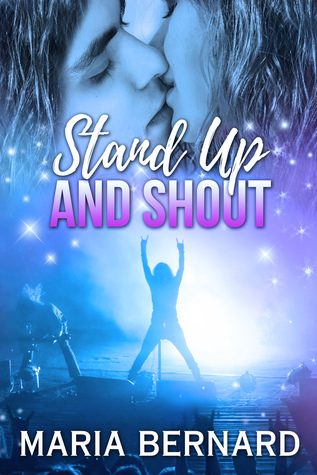 *Stand Up and Shout was previously released as part of the Get Rocked In Vegas Boxed Set. This is the seventh book in the Stick Shift Lips rock star romance series. While it is recommended that you read the series in order, each book including this one, can be enjoyed as a stand alone reading experience. Better yet, buy the entire set of seven books and binge read! To ask other readers questions about Stand Up And Shout, please sign up. Oh, so happy to have a new SSL book. Maria is such a great author. I enjoy her slightly odd rockers and their women. The SSL guys have such strong personalities, but each have such huge hearts. This new group, signed to the SSL label has struggled, but now have their chance. More please. Great story by Maria Bernard. I've loved this series from book #1. Jay and Alice have the same chemistry as the previous couples in this series. So smoking HOT! I must say this is Maria Bernard's best! When I read it as part of the Get Rocked! boxed set, I was awed. Now that it's on it's own, I had to buy it again. If you like sweet romance, a taste of heat and a strong female lead, this is the book for you. I actually read this in the Get Rocked in Vegas anthology. Always a great read by Maria Bernard! Maria Bernard is a Canadian author, residing in the Greater Toronto Area with her music-obsessed husband, and her adopted cat. Maria eats, sleeps and dreams with romance in mind. One day the idea to share the many stories and scenarios that swirl in her imagination became a reality. Her stories are heavy on the romance with a healthy dose of steam. Maria’s characters are creative, strong-willed, ar Maria Bernard is a Canadian author, residing in the Greater Toronto Area with her music-obsessed husband, and her adopted cat. Maria eats, sleeps and dreams with romance in mind. One day the idea to share the many stories and scenarios that swirl in her imagination became a reality. Her stories are heavy on the romance with a healthy dose of steam. Maria’s characters are creative, strong-willed, artistic individuals, unafraid to show their vulnerable sides. Hand in Glove is her first published full-length novel in the Stick Shift Lips Series. She has since written and published fifteen books and is currently working on a few upcoming projects.